If it wasn't for the support I have gotten through homeschool friends, family, and the online community, I really don't know how far I would have made it in homeschooling. The saying, Better together; really is true. Though I was homeschooled myself, I started homeschooling without really knowing what I was doing,(does anyone?) just knowing that this was the path the Lord was leading our family on. Through a lot of trial and error, tears and frustrations; I am finally finding my niche and becoming confident in my own skin. (Though there are still many hair pulling days) It really takes a lot to get to that place where you are able to glean advice and knowledge from others and yet not compare yourself either. I have been so thankful for all the great resources, books and blogs that have encouraged me and inspired me in this journey. I know I would not be loving homeschooling as much if I hadn't connected with other like minded mamas. 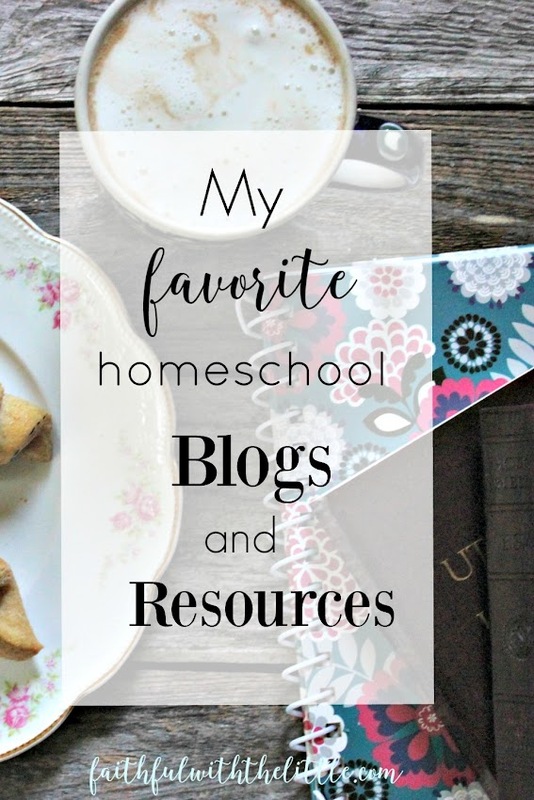 Here are some of my favorite resources, blogs and books that have been so instrumental in keeping me afloat in homeschooling. I hope they will be a great source of encouragement and help to you as well! I was so happy when I found Alicia's blog. She has so many great posts and tutorials to help you navigate homeschooling. She is very organized yet real about the struggles of homeschooling. And I love her style of homeschooling. This is your one stop place for everything. Sarah has gathered a great group of contributors( one of which is myself;) that write about everything! Recipes, motherhood, family, marriage, reviews, printables, and of course homeschooling. Kelly is a mother of ten whose desire is to train up a generation that glorifies God. I love her encouraging and real posts on faith, family and homeschooling. Durenda is a homeschool mother of 8 who has been there and done that. So much practical truths and encouragement from someone who knows. She also wrote a great book that is a must read for every homeschooler! Jennifer has done her homework and shares so many great how to's on lesson planning, crafts, unit studies and more! She offers great encouragement and lot's of knowledgeable experience. Such wealth of encouragement and knowledge about motherhood and homeschool from wonderful seasoned mothers and homeschoolers! Jodi doesn't blog a lot but when she does it's always very helpful and real. She has 5 kids and takes the most amazing pictures of her family and home. One of my favorite instagram accounts to follow! A sweet blog about family, motherhood and life. Another great lifestyle and homeschool blog by a mother of four. Great encouraging posts, ideas and inspiration. A beautiful blog about faith, life and homeschooling. Wild and Free is a community of homeschoolers that not only want their children to recieve a great education but to have a great childhood, which I am also passionate about. I have been so inspired as I have joined this community. It makes such a difference knowing there are others mothers out there passionate about the same things you are. I have gained so much great encouragement and wonderful ideas! A blog and podcasts to encourage mothers in faith, motherhood and homeschooling. Though I don't follow her method to the T I have taken and applied much of her teachings to our homeschool and it has made a vast difference. ( Especially with my boys) I love that she focuses on forming good habits and character, getting kids outside and learning from the world around them, art and music appreciation, living books, narration, dictation and copywork. The Charlotte mason living community is a great resource into this simple yet profound way of teaching and learning. Alicia(from Investing Love) also started this blog with some other homeschool moms in hopes of bringing inspiration and resources to the homeschool community. It has some great courses to get you excited and feeling prepared to homeschool. There are so many great blogs and resources out there that it can be overwhelming trying to navigate them all. I hope these few blogs and resources will help get you started if you have not known where to start. Of course there are many others that I love but just wanted to highlight a few here. I love that most of these blogs are not only about homeschooling but are Christ centered, because he is the greatest resource of all!! I love writing about homeschooling because it is of course a big part of our lives. It helps me to have this little place here to share my struggles and journey and keeps me motivated to stick at it. I hope you find some encouragement and inspiration here for your homeschool journey if you have felt lacking, and most of all know that you are not alone! What are some of your favorite blogs and resources for homeschooling??? Thank you for including my little blog alongside some of the most fabulous ones out there! I am really thrilled to offer encouragement and ideas--and that it is out there helping readers and you :-) Grateful I get to do it--and that you like it enough to share!! I recently came across your blog and have loved all the great encouragement and practical tools to help me love teaching my children! I continually need it!!! Thanks so much!! Wow! I look forward to delving deeper into your blog and these others. I follow Kinderfarm homeschooling on Instagram and enjoy their posts. Thank you for putting together this list of resource! Wow! I follow a few homeschool bloggers, but I'm not familiar with most of these. I love several of these blogs you shared! Awesome selections! Thank you so much for sharing Deliberate Homeschooling. I love passing on my ideas and lesson plans. Homeschooling excites me! Pinning this to my HOMESCHOOL boards! I love this post! I have read a couple of the blogs linked for years, like Generation Cedar, but some are new to me. I look forward to visiting them.